Nate, I can't see why di Montezemolo can be quoted as a reliable source. I am not arguing, just questioning the "sure thing" nature of Vettel-Ferrari song. e's as close to a reliable source as there could be at Ferrari, even if he's no longer president. Alonso has jumped into P2 now, 0.165s behind Button. Raikkonen up into fourth eight tenths off the top of the timing screens. Nate, any chance Grojean's in talks with McLaren? With Grosjean's backing with Total, and McLaren being in with Mobil, the possibility of that is slim. @phoenix: The fact Grosjean is still being cryptic about his future suggests there is still a chance of another drive for him further up the grid. Grosjean said earlier this year his Total backing wouldn't be a hindrance at a team like McLaren. @MichaelBialocur: I can't see past Hamilton, especially if he wins here. 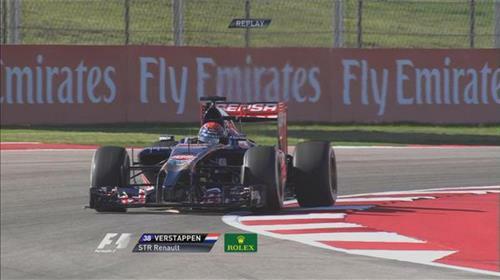 Magnussen has now jumped above Button into P1, setting a 1:41.078. How is the Ferrari of Alonso looking so far this weekend Nate ? @MB: Hard to accurately tell after 27 minutes, but he's currently third. Ferrari flatters to deceive on most Fridays though, so don't read too much into practice. That's a good rule of thumb for any driver. Alonso kicks up a bit of gravel on his latest run and can't improve on his current time. Do you see Alonso making a move to Merc in 2016 Nate? Do you envision the Rosberg-Hamilton relationship degrading to that extent? @Siddhesh: I can't see why Mercedes would get rid of Hamilton, especially if he wins the championship this year. The relationship would have to implode completely but Mercedes has made it clear it thinks it has the best line-up on the grid currently. Maybe to early to say but i think, since japan, McLaren finally find something extra. Hamilton has split the Ferraris in fourth. He's currently eight tenths off the pace of Magnussen. 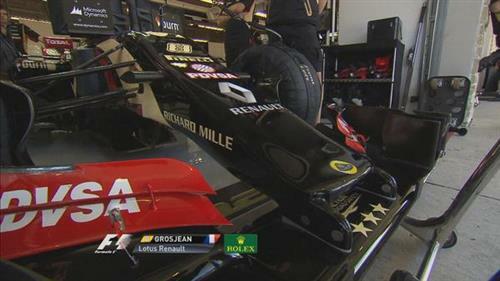 Grosjean, by the way, is 16th with that 2015 Lotus nose. He's now complaining of a delaminating front tyre and enters the pits. No news from Jules Bianchi this weekend Nate ? @Domi: His family released a statement yesterday. It didn't add anything new to what we already knew - he's still critical but stable in hospital. I think this year practices were practices. Noone could really tell what would happen for the qualify. May be except the Merc because they are very consistent. @kkunakorn: I think, as a rule, you shouldn't read much into what you see from practice. Teams are running so many different aero parts, focusing on various parts of the weekend. Dam stuck at work! Was keen to see that Lotus nose in action! Any pictures? Can FIA force Vettel to run in quality? @Wetcoaster: Considering the rules force him to start in the pit lane regardless, it would seem very bizarre for them to do so as Red Bull wants to save mileage. @Nate: Though, as I recalled a couple of years back you could tell somewhat would happen in the quali and the race from the practices but not this year. @Matt1812014: It is likely to those two teams, yes, unless we see a mistake higher up the order. Thanks Nate! Looks good. Very flat though. And increased delamination... not cool. Vettel can go out and do a slow lap and get knocked out of Q1. All depends on when they need to start changing the engine package, I guess. @Bjorn: Red Bull wants to sit out qualifying so it can save mileage, so I can't see them going out at all. Why are the Mercs so slow? @SahilShah: No idea! That's the thing with practice, we don't know the fuel loads of the teams or what run plans they are on. As I said earlier, always take practice times with a pinch of salt, especially in a situation where Mercedes are fourth and sixth early on. @Domi: I don't agree with the idea of 'sandbagging', because it doesn't benefit teams to intentionally mislead other teams. What is more likely is that they are on a run plan which involves a heavier fuel load, or a tweaked set-up, as they search for the ideal set-up for later in the weekend. With the small field, how many cars to out in Q1? @FastLarry: The new qualifying format will see four teams out in Q1 and four out in Q2. @RogertheCabinboy: Force India is yet to confirm if there is an issue with Hulkenberg's car yet. 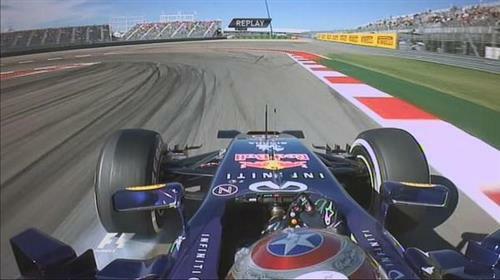 I think its not a bad idea for Vettel to get the penalty out of the way now. Who knows, he might well pickup a big haul with double points if more PU's fail at the last race. True the Mercs are unusually slow today. What do you think of Force India's chances this weekend, and why Hulkenberg has gone off the boil in the last 3-4 races compared to Perez?